For the past five years, Muhlenberg College has hosted a Lunar New Year festival. The festival was created in hopes that the students that celebrated Lunar New Year would be able to have a safe space where they could celebrate their own culture despite being away from home. Muhlenberg also wanted their students to be aware and develop an interest of the different cultures around them. This Lunar New Year celebrated the year of the boar. Last week, the Lunar New Year festival started off with the Cultural Panel. Throughout the week, there were multiple events happening throughout campus to celebrate the incoming Lunar New Year. Each event was created in hopes that the people of Muhlenberg would become more aware of the meaning behind the Lunar New Year. While the campus celebrated the Lunar New Year last week, Feb. 4th is the actual Lunar New Year’s date. The members of the Asian Student Association decided to end the Lunar New Year with a talkback to discuss the events that took place across campus. The talkback was led by the president, Christopher Chin ‘19, and vice president, Anh Truong ‘19. Throughout the talkback, we were able to hear how some of the events made an impact on them personally and on Muhlenberg as a whole. The talkback allowed those who came to see how Lunar New Year is observed in their home life compared to Muhlenberg. There are various Lunar New Year traditions and narratives that can be considered in celebration time. Overall, the events of Lunar New Year were considered to be a success due to the popular turnout at most events. 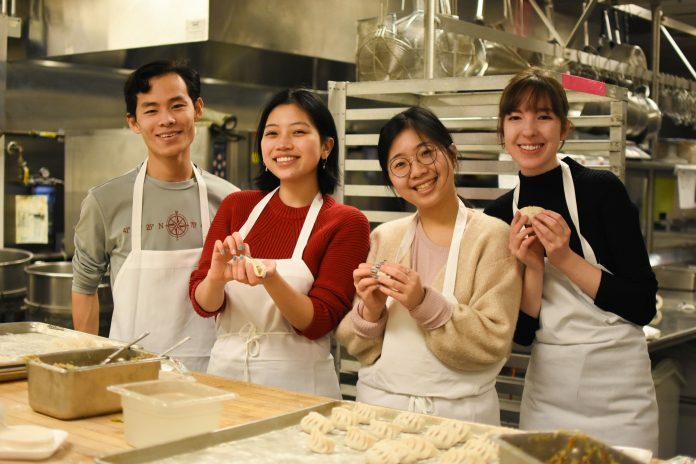 On Jan. 29, there was dumpling folding, where students, faculty, and staff were invited to make dumplings alongside the chef of Wood Dining Commons. There was a great turnout for that event. Different members of the Muhlenberg community came out in support of the Lunar New Year. It was a great time to either hang out with your friends and family while also learning about the culture. Events like dumpling folding, International Tea, Lunar New Year Dinner, and stuff-a-plush were inspiring events that brought forth the spirit of Lunar New Year. Lunar New Year is about being with your family and friends and just celebrating the New Year. In some traditions, people would receive money from their loved ones so that they could have good luck in the new year. The money would come in small red envelopes. During the International Tea event, there was an attempt to emulate the giving of money by giving people who participate red envelopes and inside the envelopes were information about the Lunar New Year and a gift card to upgrade your order from Java Joe’s. The whole point of having Lunar New Year on campus is to open a conversation between those who celebrated Lunar New Year and those who have little to no knowledge of Lunar New Year. The Asian Student Association successfully introduced the Lunar New Year to campus life; informing students of this new year celebration as well as its importance to the people around them. The members of the Asian Student Association talked about the events that they could have done and events that Muhlenberg might see next year. As the talks of how the events were and what might be seen next year came to a close, it was decided that the best way to end the celebrations was with sparklers. A joyful end to a grand holiday.